After almost 40 years of firearm ownership and the maintenance that goes with it, I stumbled across gun oil that made an instant impact on not only me but the function of my firearms as well. Until that point I never really gave gun oil much of a thought. I started out with 3 in 1 oil from my dads basement, graduated to Singer sewing machine oil out of necessity and finally onto a bonafied can of a manufacturers gun oil under threat of death from my mother over the use of her sewing machine oil. That was a lot of years ago and a lot of different gun oils ago. I will not go into a litany of names and manufacturers, rather I will explain the side effects and failings of the oils I’ve used over the years…. Besides, what’s in a name, right? To explain a little about my use of firearms, let me explain what and how I use them . I use a pump action shotgun with a deer slug barrel for deer season because I live in a really liberal state. I guess they figure I can only kill someone with a rifle because they have outlawed them for hunting deer…but not Coyotes…. Because no one is an advocate for coyotes…yet. So for Coyotes I use a semi auto rifle built on …wait for it… an AR platform. Right? Because no one uses them for hunting….. I also use a semi auto shotgun for bird hunting because it’s faster than my pump when I miss…which is frequently. Another pump with a specialty barrel for turkeys, which I rarely if ever miss, I think because they’re so big, and last but not least my everyday concealed carry semi auto pistol. So with all the different type of firearms that I use you think that I would have given some thought to the gun oil I use to maintain them. Well, I really hadn’t until the day I pulled my deer shotgun out of the safe to give it a wipe down to prepare for the season. When I removed it from the safe it had a sticky feeling to it. Sticky to the point it made my hands feel like a just eat a spool full of cotton candy. Hmmm, I guess I should give this a fast teardown and re lube it I thought. While disassembling the shotgun it became rapidly apparent that the slide for the pump action was darn near glued in place. Once torn down the cleaning solvent I used turned this “stuff” into almost a varnish that balled up as I cleaned the shotgun. It had a yellowish tinge to it and seemed to take forever to get off of the gun. At the end of the process I headed back to grab the gun oil, right? To find the oil that did the deed. As I stood there with the can of aerosol oil in my hand I realized that I was just starting the process all over again. So I ran to the local big box store and picked up a can of the ever present green and yellow spray gun oil and finished the job. Fast forward a week and I’m done with my scentless soap shower, dressing in my scentless washed clothes spraying each layer of my undergarments with scentless spray before I put on my scent locking overalls and boots. Done! Ready to deer hunt! I take my trust shotgun from the case and am immediately overwhelmed by the smell any gun owner instantly recognizes as gun oil and cleaner. I silently think, this is bad, I’m sure I’m going to get winded. Fast forward as I walk out of the woods empty handed learning that deer DO smell gun oil. Now I’m really thinking about gun oil right?! What was that stuff all over my gun and why was it so sticky? Well with a little diligence and a connection to the internet I find out it is additive residue from the “oil” that I had wiped the gun down with at the end of the season. The “oil” part had evaporated leaving this sticky residue. I also notice two small rust spots on the barrel that were never there, so I know the corrosion resistance of the “oil” wasn’t to great either. So as is with many other things, armed with a little knowledge and thanks to the internet, I became dangerous! Reading labels and reading reviews. I was going to find great oil! Teflon, silicone, graphite Oh Boy! Somewhere in the midst of reading and even watching videos on gun oils I discovered that many of them were bought and paid for by the manufacturer. How can that be good? I learned some people use motor oil, and then learned that isn’t good either. I did learn ALL of the STUNK and were going to be no good for deer season. Enter a close friend of mine who gave me a little bottle of Lucas gun oil. It had a deer on the label of all things. Handing it to me he said “here, you shoot guns, I ain’t got no use for this, A guy gave it to me” Little did he know that he had changed the gun oil world for me. I took the bottle home and threw it in my gun room without much thought. Months later I took my trusty deer shotgun out of the safe to sight it in for deer season. After 20 or so rounds I threw it back into the case and headed home. I’ve hunted deer with this gun for over 15 years. It fits me like my own arm. It is as close as one can get to an extension of your own being. It is neither fancy nor pretty, but it is a tack driver out to 130 yards which I find incredible for a slug gun. I know this gun like I know myself. The next day I take the gun down and clean it. As I start to reassemble the gun, I notice the Lucas gun oil with the deer on it on the bench so I pull out a clean rag and started to wipe the components down as I put the gun back together. As I’m putting it back together I am squirting oil on parts and wiping them off with the rag I notice I’m not smelling gun oil. I put the rag to my nose and there is no smell… Eureka! I’ve found my deer season oil! Fast forward to a week before the season, my son in law is so impressed with the shot gun barrel combo I have, he purchases one himself. We set it all up with a new scope and he’s ready to go. He wounded a deer the first day out and was dismayed because the gun would not cycle after his first shot. He claimed it was so hard that he lost sight of the deer while he racked the shotgun a second time. I tried the gun myself and was astounded that it could be so hard. We tore the gun down, cleaned it and reassembled it using the Lucas gun oil. I handed the completed gun to him with the slide open. He closed the action, looked up at me, opened and closed it again several times with his jaw wide open. His first words were, “What did you do to this gun? I took the gun back and cycled it numerous times, it felt like my 15 year old, smooth as butter. I told him “I think it’s the oil”. That was when both of us discovered what really good gun oil is. 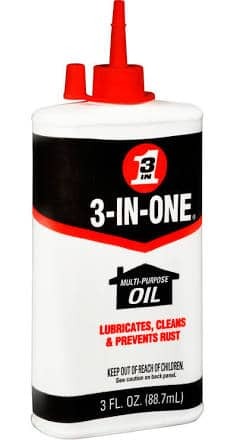 With a little further research I discovered who Lucas oil is. I learned the science behind the technology. I learned than mineral oil is ok but when you specialize in making and designing lubricating oils there is a whole lot more than just putting mineral oil in a bottle. We’ve been using Lucas original gun oil for three years now. It’s perfect for deer season but more importantly is the best gun oil we have ever used. It has spread, but doesn’t run. It has creep, but doesn’t run out. It has water displacement qualities and inhibits rust better than any gun oil we’ve used. Put you gun away for the season and it isn’t gummy or sticky when you take it out of the safe. I have a firearm for each different season we have, but I only have one gun oil. 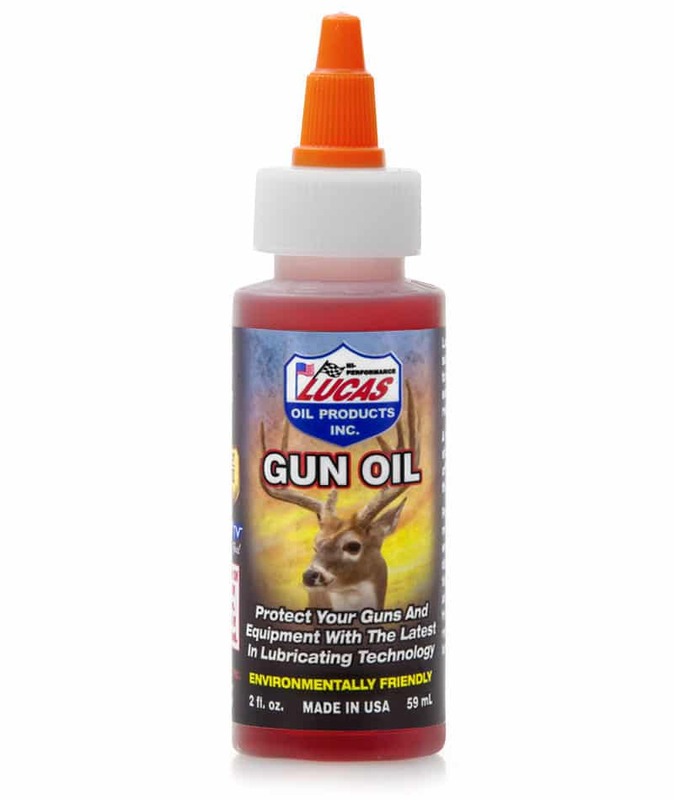 Lucas gun oil, it’s the only one you’ll ever need. I have NOT been paid to review this product, nor have I received compensation in any form for its writing. Hey Buddy!, I found this information for you: "All Gun Oil Is Not Created Equal". Here is the website link: https://thegunrights.com/gun-oil-not-created-equal/. Thank you.